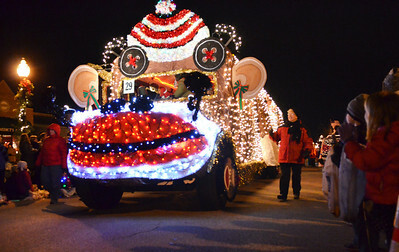 The Nighttime Holiday Parade was held in Crystal Lake while the Lighting of the Square was held in Woodstock on Friday, November 23, 2012. 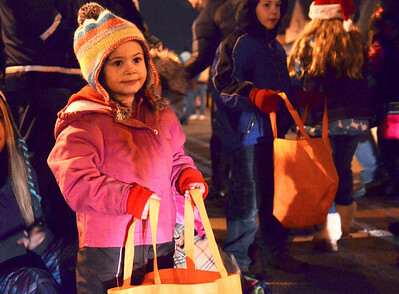 Monica Maschak - mmaschak@shawmedia.com Emma Shea Kuhn (left), 4, waits for candy along the Crystal Lake Holiday Nighttime Parade route on Friday, November 23, 2012. Parade goers awaited Santa's arrival and the lighting of the tree on Williams Street. 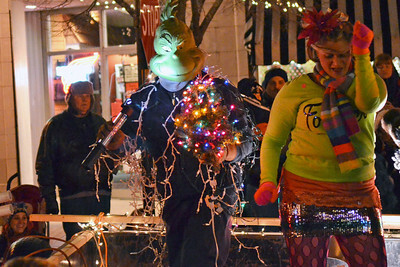 Monica Maschak - mmaschak@shawmedia.com A float member dressed as the Grinch made himself visible to the crowd wih a flashlight and flashing Christmas lights at the holiday parade in Downtown Crystal Lake on Friday, November 23, 2012. Monica Maschak - mmaschak@shawmedia.com Parade goers wave at a passing float during the holiday parade in Downtown Crystal Lake on Friday, November 23, 2012. 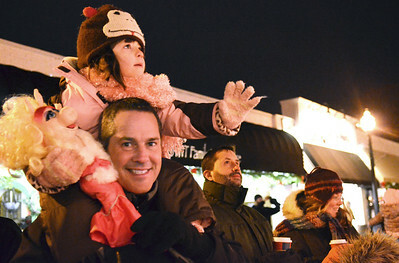 Monica Maschak - mmaschak@shawmedia.com Reagan Kauzlarich, 5, waves to a passing float as she sits on the shoulders of her dad, Tony Kauzlarich, at the Nighttime Holiday Parade in Downtown Crystal Lake on Friday, November 23, 2012. 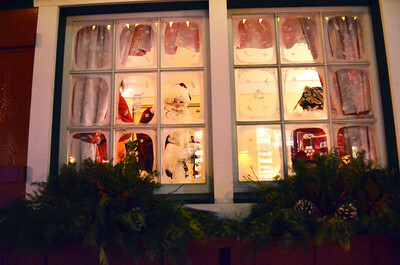 Monica Maschak - mmaschak@shawmedia.com Santa looks out of the window after arriving to his house in the Brink Street Market in Downtown Crystal Lake on Friday night. Santa and Mrs. Claus greeted children and heard their wishes after lighting the Christmas tree at the nighttime holiday parade. 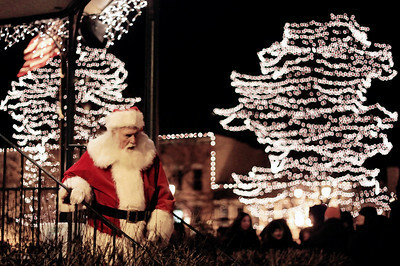 Sarah Nader - snader@shawmedia.com Santa greets children on the Woodstock Square after the Lighting of the Square in Woodstock on Friday, November 23, 2012. The event brings out a crowd of nearly 2,000 every year. 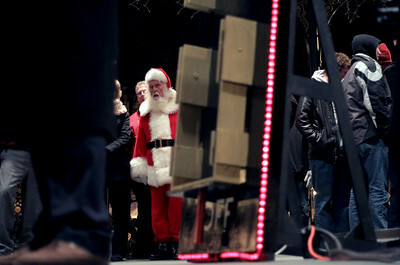 Sarah Nader - snader@shawmedia.com Santa walks to his house on the Woodstock Square after the Lighting of the Square in Woodstock on Friday, November 23, 2012. The event brings out a crowd of nearly 2,000 every year. 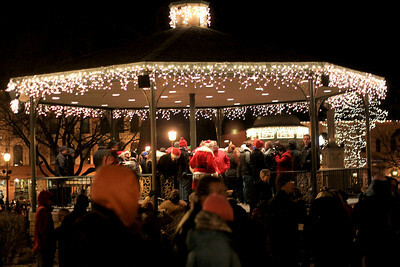 Sarah Nader - snader@shawmedia.com The Lighting of the Square in Woodstock was held on Friday, November 23, 2012. The event brings out a crowd of nearly 2,000 every year. Sarah Nader - snader@shawmedia.com Children play on the square before the Lighting of the Square in Woodstock on Friday, November 23, 2012. The event brings out a crowd of nearly 2,000 every year. 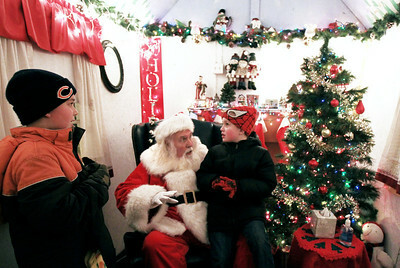 Sarah Nader - snader@shawmedia.com Dominick Faillow (left), 9, of Marengo and his cousin Anthony Faillow, 7, talk to Santa on the Woodstock Square after the Lighting of the Square in Woodstock on Friday, November 23, 2012. The event brings out a crowd of nearly 2,000 every year. 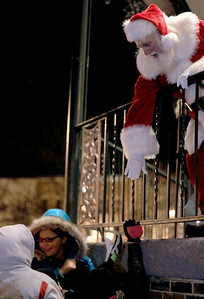 Sarah Nader - snader@shawmedia.com Anne Feye, 11, of St, Louis waits to talk to Santa after the Lighting of the Square in Woodstock on Friday, November 23, 2012. The event brings out a crowd of nearly 2,000 every year. 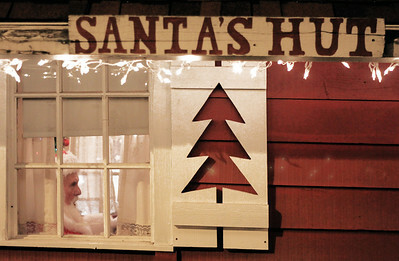 Sarah Nader - snader@shawmedia.com Santa talks to children in his hut on the Woodstock Square after the Lighting of the Square in Woodstock on Friday, November 23, 2012. The event brings out a crowd of nearly 2,000 every year. 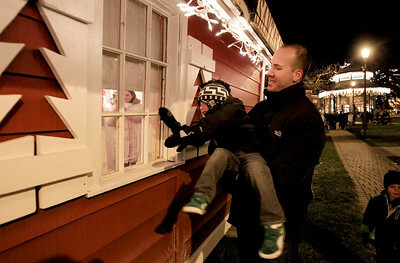 Sarah Nader - snader@shawmedia.com Jonah Aldrete of Algonquin holds his son, Ethan, 4, up so he could see inside Santa's hunt on the Woodstock Square after the Lighting of the Square in Woodstock on Friday, November 23, 2012. The event brings out a crowd of nearly 2,000 every year. 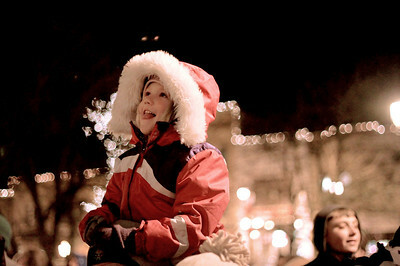 Sarah Nader - snader@shawmedia.com Madeline Day, 5, of Woodstock reacts after seeing the lights turn on during the Lighting of the Square in Woodstock on Friday, November 23, 2012. The event brings out a crowd of nearly 2,000 every year. 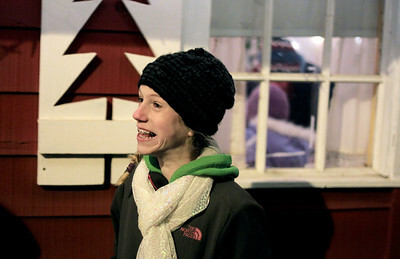 Anne Feye, 11, of St, Louis waits to talk to Santa after the Lighting of the Square in Woodstock on Friday, November 23, 2012. The event brings out a crowd of nearly 2,000 every year.